Incorporating exceptional design and absolute waterfront views; The Edge offers your business an outstanding level of commercial amenity with flexible work spaces, cutting edge IT infrastructure, easy access, and secure underground parking in a world class location. Commercial office space comprising of approximately 7,000sqm over 2 stand-alone buildings. Absolute waterfront location with northern aspect across Lake Kawana. High-speed fibre-optic with 24/7 back-up power. Certified 3-star NABERS Energy rating – The Edge West. 260 car parks including 80 on-grade and 180 underground parking bays. Full height glass windows and extra-height ceilings for natural light. 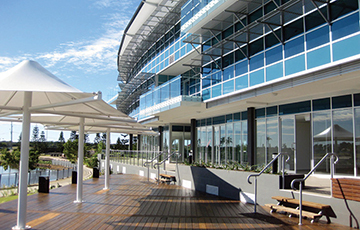 Located close to the new Sunshine Coast University Hospital and Oceanside Health Hub. Building signage opportunities with exposure to Nicklin Way (est. 40,000 vehicles passing daily). “The Edge precinct has been a great fit for our Company. When assessing the commercial rental market at the time, we were looking for a fresh, modern and creative space to conduct our business from. We wanted a landlord who would consider not only the value their tenants brought to the property – but who were also selective in choosing businesses that would be a good “fit” for their existing tenants, and of value to the surrounding community.